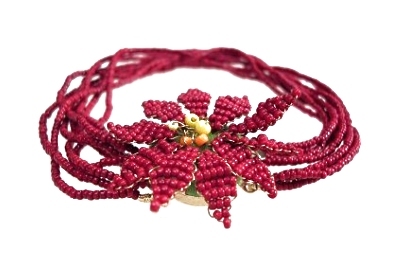 A simple strung multi-strand bracelet finished with a clasp embellished with a French-wire beaded flower. These miniature wire beaded flowers are wonderful decorations which can be used as ornaments by themselves or incorporated into pieces of jewellery. The techniques for making these flowers are covered in my Miniature Wire Beaded Flowers Class.